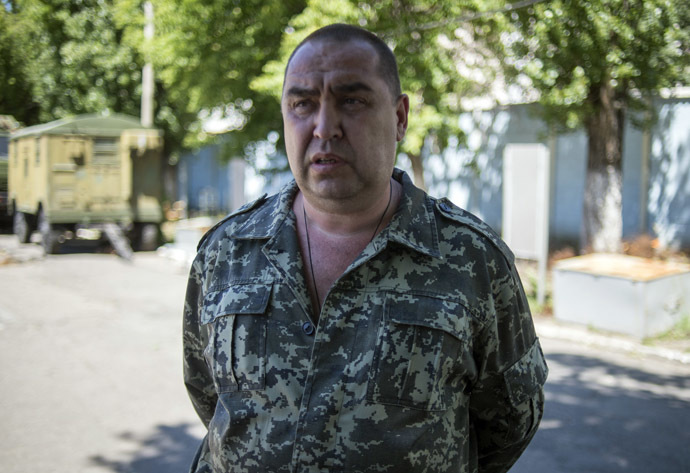 The leader of the self-proclaimed Lugansk People’s Republic (LPR) Igor Plotnitsky has thrown down the gauntlet to the Ukrainian President Petro Poroshenko, pledging that “the one who wins, will set his terms” for ending the bloody conflict in the region. Plotnitsky’s “terms” are multiple, among them an immediate cessation of all hostilities; withdrawal of all legal, semi-legal and illegal armed groups of Ukraine beyond the administrative boundaries of Lugansk and Donetsk Regions; the start of peace negotiations between Ukraine on one side and the LPR and Donetsk People’s Republic (DPR) on the other. “For the fight to be fair, each party has a right to engage 10 observers-seconds and 10 mass media representatives,” Plotnitsky informed, adding that he doesn’t mind a live broadcast on any TV channel, gallantly leaving the choice of location for the fight and choice of weapons up to the billionaire chocolate baron-turned-president. “Why stir up mutual hatred and destroy people, cities, economy? You and I will have to heal these wounds for decades! Isn’t it better to end all disagreements in a fair fight?” Plotnitsky wondered. “God will judge and will not tolerate unjust victory”, he stated. Ukraine’s Ministry of Foreign Affairs has been outraged by the proposed ‘fight’. “The only ‘fight’ Plotnitsky deserves is with a Ukrainian court,” ministry spokesman Evgeny Perebiynis tweeted. On Wednesday Ukraine’s prime minister ruled out direct negotiations between Kiev and militia. “We will not hold direct negotiations with Russian terrorists,” Arseny Yatsenyuk told a government meeting, urging Russia to abide by a peace formula drawn up in the Belarusian capital, Minsk, in September, UNIAN news agency reported. Russia has also repeatedly said that all parties including Kiev should follow the Minsk agreements. During rallies in early April, residents of the Donetsk and Lugansk Regions, who haven’t acknowledged the legitimacy of the February coup, proclaimed the establishment of ‘People’s Republics’, which, after the referendums held in May, declared sovereignty and later formed an alliance called ‘Novorossiya’ (New Russia). Kiev recognizes neither the DNR nor LPR. In April, Kiev launched a military operation against the disgruntled residents of eastern Ukraine. According to the UN, over 4,000 civilians have become victims of the conflict as of mid-November, and more than 9,000 have been injured.